Művelődési Szint (MÜSZI Art & Community Centre) is a cultural space operating on the 3rd floor of a socialist-style department store. 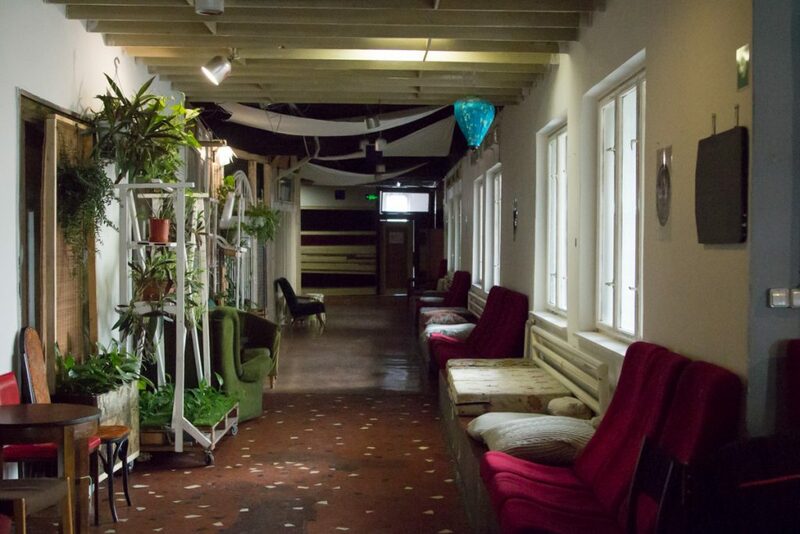 Besides hosting events ranging from concerts to theatre performances and film screenings, Müszi also offers studios for artists, NGOs and start-up companies. 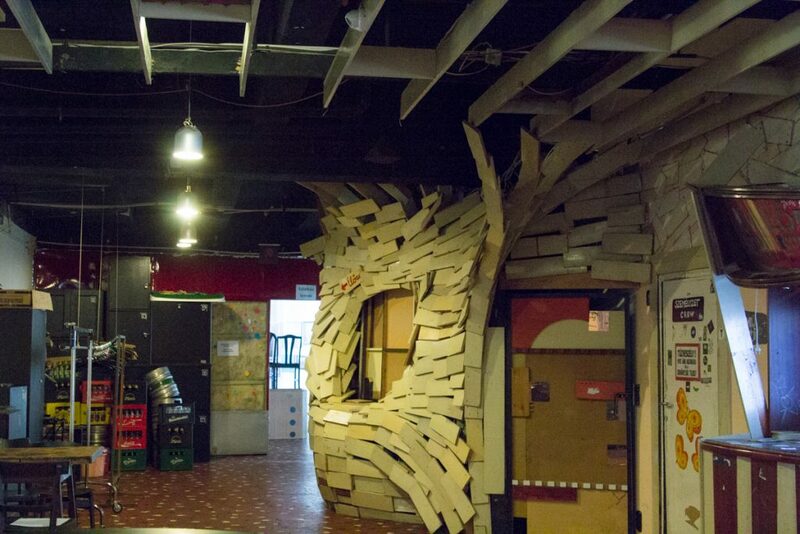 Müszi stands as an unprecedented venture in Budapest, a venue that positions itself as an independent, self-sustaining “house of culture,” and offers affordable space and activities to a wide range of age groups, while combining its artistic and social mission with business principles in a sustainable manner. In what circumstances did you launch the Művelődési Szint? Müszi was born from the ambition to revive the tradition of the ‘house of culture’, a community space giving room to a variety of activities, an open-for-all public space where consumption is not required. 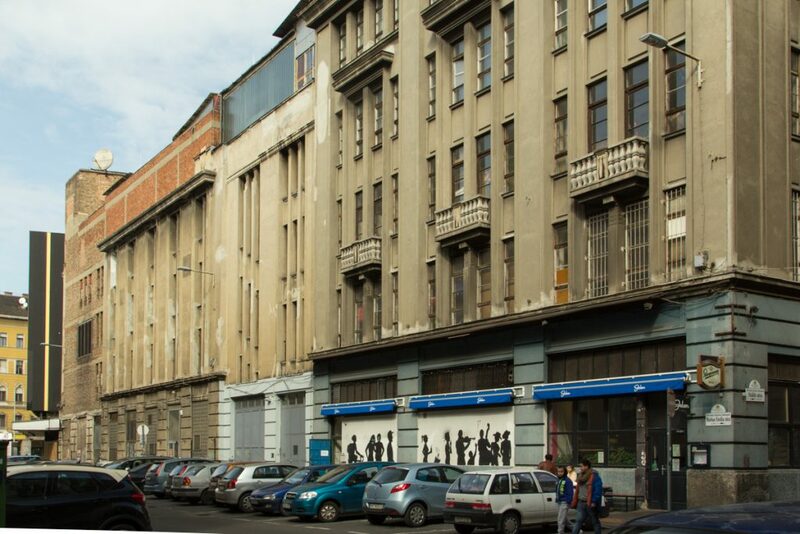 In the winter of 2011, the most important alternative cultural institutions of Budapest were shut down, those that not only provided space for entertainment, but also for creation and artistic work. At the same time, we also lost our building, which we had been using for 5 years as artist studios and for wood workshops. I was teaching a theatre class at the Moholy-Nagy University of Arts and Design; we were approaching the end of a seminar, before the rehearsals in December and the performance in January, when we found ourselves on the street. Müszi is located at a very unusual site: the formerly vacant third floor of a socialist-style department store, right at one of the busiest squares of Budapest’s historical centre. How did you find this place? We found this space when it had already been empty for 6 years. The owner did not really want to rent it out: it was complicated to adjust the building’s infrastructures and provide a staircase to the floor, especially since the rooftop bar occupied all of them. I got in touch with the owner and told him that we would like to use the space for 6 weeks, but we have no money. He told me that we could use it if we cleaned it up. We moved in, cleaned up in 3 days and began to work. Following the preparations in December, the performance took place in January 2012, lasted 5 days and attracted over a thousand spectators. It brought a lot of visibility to the floor: suddenly everyone discovered this space, everyone felt that something was beginning here. Following the event, the owner of the building, who liked our presence, offered us a rental price. We decided to move ahead with renting the entire space of 2800 m2. We realised that we had nothing to lose, and we negotiated a progressive rental agreement, starting with only the utility costs for a half year, then half-price for another 6 months, then full price. It was essential for us to find a privately owned space to avoid political pressure. Was private ownership really necessary for this project? From the beginning, we were in a political situation where we decided to go ahead with developing Müszi because we did not see the possibility of receiving any subventions in the coming years for the kind of theatre we are doing. We had to create the circumstances within which we could work. We wanted to build a theatre for ourselves, and we built it, even if we have not really been able to harness it. When we came here, we decided to stop applying for grants, in order to avoid supporting the system by paying application fees, and to avoid time limits as well as accountancy and reporting obligations towards the institutions. In this way, the whole project can develop at its natural pace. It was important to reassure ourselves, because we wanted to create long-term possibilities. For instance, we installed an intercom in order to oblige the authorities to announce their visit. We knew from the beginning that we needed to create an independent and safe place, by all definitions. How did you assess what spaces you would need in Müszi? Our business model is based on the recognition of the large demand for affordable workspaces, both within the fields of art as well as in activism. Looking for tenants, we made a call for applications, where the criteria for selection included the candidates’ activity, their willingness to contribute to the community, and their capacity to pay rents. Through the application process, we familiarised ourselves with the precise needs of prospective tenants, and this influenced and provided information for the design of the whole floor. The structure of Müszi was constantly changing. We knew we needed to create as many studios and offices as we could. And these had to be small because today’s NGOs cannot afford larger spaces. But we also wanted to have event venues: a theatre hall, a lecture hall, a room for dancing – we definitely wanted to have mobile spaces. In the beginning, we had a community space that we could let, and we began building the first studio spaces that people could rent. We had a small bar, the size of a table, selling cold and hot meals, which could support itself, so that at least we would not have to use the money from our program revenues. We began by collecting all available materials from the recently closed venues (Tűzraktér, Merlin, Sirály, Gödör, Kossuth Mozi), as well as from a nearby Chinese restaurant. In parallel, we left flyers everywhere announcing that we are looking for furniture, and we received many items. Besides this, we had all the sceneries of our previous theatre pieces, the collection of 8 years’ work. And there was a double ceiling, made of wood, covering the entire floor area. We used these to build walls later. To a large extent, the first phases of the construction work were done by prospective tenants. To motivate the volunteers, we accommodated many of their ideas in the organisation of the new spaces. This is how many originally unplanned services, like the children’s room, took shape. Everybody was working for free at first. We did the construction slowly and gradually; we received all the construction materials for free, everybody worked for free, but at least we shared a meal everyday and we could take on outside jobs as a team to generate some revenue. It would have cost us a fortune to get a new fire safety classification, as this was formerly a showroom floor of the department store, so we adapted to this function; we divided the showroom area into different parts. Everything was built in a way that allowed mobility through it, and could be taken apart with a screwdriver, because everything is built as a stage set. Nothing reaches the ceiling so we do not have rooms with separate airspaces. We had to pay attention to this, to comply with the strictly compulsory fire safety directives. How did you establish Müszi’s financial sustainability? We wanted to create a community space, not through grants but with a self-sustaining economic basis. This is also related to the redefinition of cultural centres, raising awareness that the members of the community are responsible for the existence, maintenance and development of this place, and they can contribute either by volunteering or donating. We primarily asked for a contribution to our utility bills: we asked people to give us the equivalent of the time they spend at Müszi, when they are not at home using heating and water. The goal was to provide several pillars for Müszi’s operations and financial background. This is one of the pillars that works well, because most programs pay rent for the space, or we ask for a utility contribution of 200-300 forints per person, or ensembles pay for rehearsal spaces – in one way or another, we ask for contribution from the people who use the space. This is a mission because we had been spoiled: for forty years, cultural centres operated free of charge, and the state paid folk dance companies to perform twice a week. The other pillar was the pub, but we did not want alcohol to sustain Müszi. We did not want to establish a nightclub, we wanted to focus on daytime activities, to be able to open at 10 a.m. and have people drink their coffee and work here. We achieved this goal, on some days our daytime revenues equal that of the night income of other places. But it is important to realise that the café is a very small segment of Művelődési Szint, it is rather like a café in a theatre. It is a supplementary pillar; it cannot sustain a 2,800 square metre venue, nor is it its purpose to do so. Our capacity is limited to 300 people due to fire safety concerns, but that is not a problem. In the meantime, we developed the café, we selected suppliers carefully, we worked on the design, we got our first coffee machine. The café grew in proportion with the way people started using the space. Our third economic pillar consists of the studios; they are the fixed basis of Müszi because tenants pay a fixed fee per square metre, well below market prices. The rent for spaces on the sunnier side differs from that of darker spaces. The rent covers approximately 60% of our maintenance costs. Some tenants have been here for three years in the same studio, which makes us feel that they did something for themselves, and they are happy to pay the rent because they gladly contribute to an environment like this. We also have four event halls: the large auditorium can accommodate approximately 120-180 people, and is suitable for conferences, screenings, cultural and NGO programs, and workshops. There is a studio that specialises in exhibitions, but it also hosts daytime programs. There is a large cinema hall in the back, we usually have theatre and cinema events there, as well as loud concerts at night. We also have a workshop room; the smallest with 63 square metres, and people love to rent it for more intimate gatherings of 20-30 people. 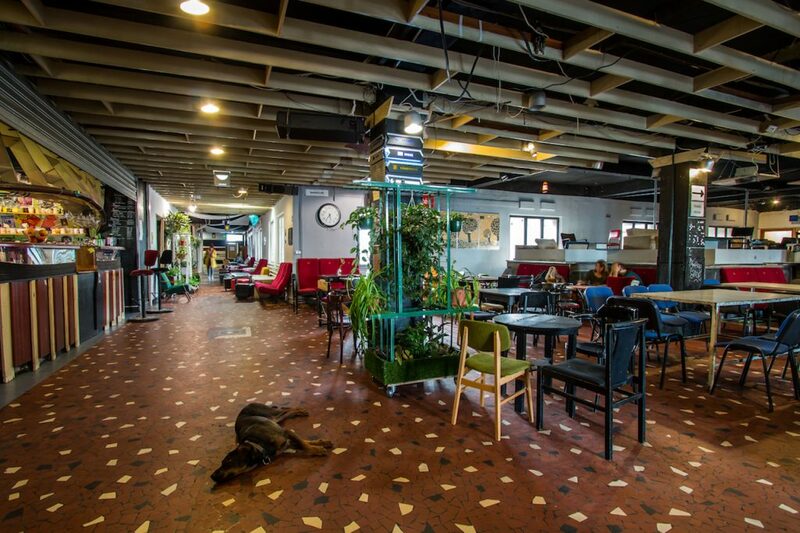 In addition, we have the large café area. We can have simultaneous events in these spaces, for example, they are all full on Friday and Saturday afternoons. We call these community spaces, they have fixed rental prices as well, but there are also individual agreements through which we support NGOs. On the other hand, from those who can afford to pay more we accept more, so we basically have separate agreements with each group. This is important because it means a constant, personal relationship with them, and we feel like we are working together, for example we help them with the press of their events. In addition, we have several smaller economic pillars, for example we established a Müszi shop where we sell products made in in-house workshops or craft studios, and we organise market days, which also generates a minimal revenue. We also have a co-working office where people can rent desks. We have various small-scale activities that also contribute to Müszi’s revenues. When did Müszi become self-sustaining? The normal operations of Müszi cost approximately five million forints (approx. 16,000 euros) monthly. This amount includes rent, utilities, the employee’s wages and occasional renovations. We do the renovations gradually because we do not have sufficient capital to pay even the most pressing renovations at once. Müszi became self-sustaining after two and a half years. During this time the news of our mission reached many people, we are getting more and more guests who first found us through programs, and are now actively spending time here, they come in to work at Müszi. This makes our programs increasingly colourful, and we have more opportunities to support civic programs because our situation is easier than a few years ago. By now, we have a 70% full house on a daily basis. At the same time, the more Müszi is developing, the more demands and costs increase. What are the next steps for Müszi? We have an unexploited economic pillar: we founded Müszipolisz and we issued our own currency, the Müszi Lujza. We want to try a monetary but not economy-based cultural barter system. We also divided Müszi into squares and streets, we adopted the street names replaced between 1989 and 2014, for example Moszkva tér and Felszabadulás tér. We are already using the Müszi Lujza within Művelődési Szint, you can use it in the shop, in the café, at the entrance, to buy tickets for our programs, for various services, for studio rent. The point of the donation system is that we do not give back change when you use 1000 and 5000 bills so you can support the person whose services you are paying for. Our long-term ambition is to become a node in an emerging network of independent cultural and welfare providers. The next task is to create our social net. Not only to expand the services of Müszi, but also to be able to direct people to the services present in the neighbourhood, to distribute clothes to the homeless, as well as hot tea in wintertime. We envision this as part of an independent social welfare network, as part of an independent reality. In January 2018, Müszi opened at a new location in Budapest’s 7th district. Müszi is featured in Funding the Cooperative City: Community Finance and the Economy of Civic Spaces. Budapest, Community, Culture , civic space, community, culture, education, Funding the Cooperative City, Hungarian, social inclusion, video, welfare, work.